This article describes how to configure Bizagi Web parts for SharePoint, once you have already installed them to your SharePoint server. For more information about Bizagi Web parts and their installation, refer to Installing the Web parts. Before you start to use Bizagi Web parts, make sure you perform the initial Web parts central configuration (required only once), to specify details regarding the connection between your SharePoint server and your Bizagi Work portal. 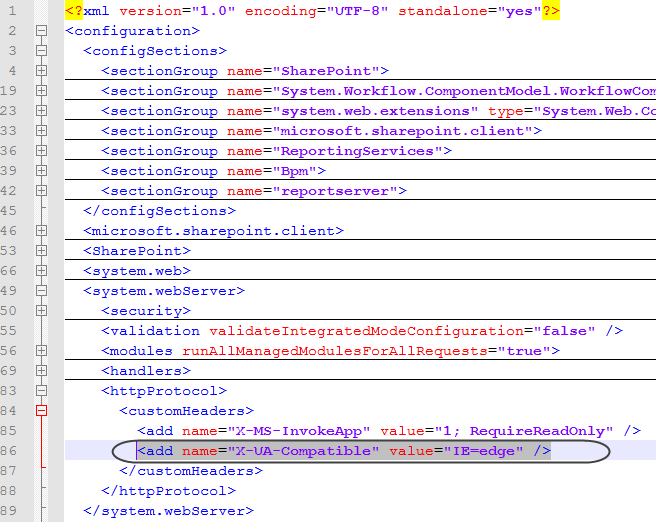 The following configuration is carried out on SharePoint sites and may be achieved through a browser. 1. Locate the Site actions drop-down option, and click on Site settings. You will see the installed Bizagi Web parts under the SharePoint Extensions category. 2. Locate the Configuration list at the right hand side, and click on it. You will see a list which can contain one or more items. •Bizagi project name: The name that identifies this item's purpose (connecting to a specific Bizagi Work Portal). It should be unique and meaningful towards representing the Bizagi project to be integrated. •Bizagi project URL: The URL location to your Bizagi Work portal. •Service account: The name of the account used to connect to Bizagi. Keep in mind that this service account is involved for the actual configuration and runtime (even though, the user's Windows credentials are also used for his or her Bizagi access). •Service password: The password of that account used to connect to Bizagi. •Service domain: The domain for that account used to connect to Bizagi. The service account used to configure the Web parts (as well as end users accessing the Web parts) needs to be created as a user in Bizagi. 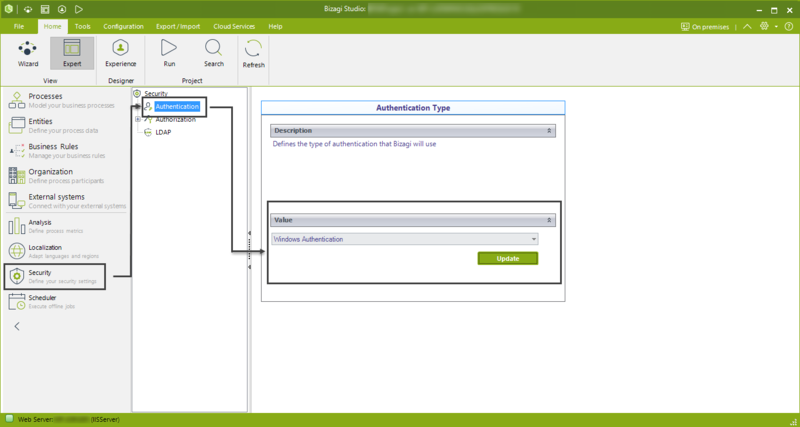 The service account requires administrator rights on Bizagi plus the possibility to start processes. Click on Save to complete the Web parts central configuration. Changes in the configuration list will most likely require an IISReset of your SharePoint services. •You may click on Edit Item to modify the connection details anytime. •You may also choose to add additional items (should you be integrating with more than 1 Bizagi Work Portal). Once you have completed the Web parts central configuration, you are ready to start using Bizagi Web parts for SharePoint directly in SharePoint content. For more information about this, refer to Using the Web parts. Follow these considerations when using the Web parts. When integrating Bizagi in portals, it is recommended to adjust the settings for your Bizagi Work portal so that resources stored in the IIS cache are not disposed as frequently. This is recommended given that users will not be accessing Bizagi Work portal on a regular basis (i.e, on a daily basis). For Bizagi work portal setting at the IIS, you would need to edit its application pool so that recycling is optimal for your demands. 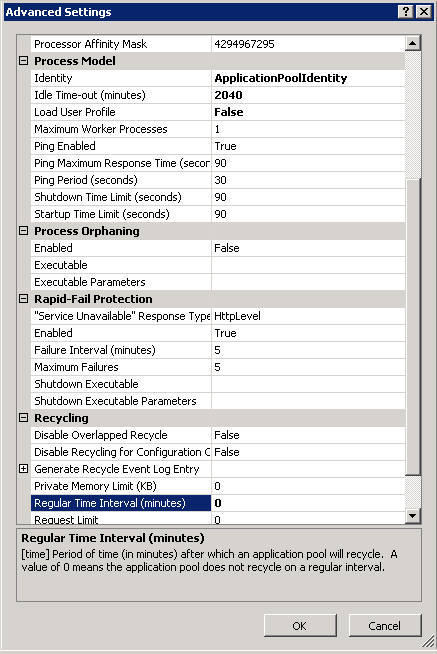 •Disabling Recycling by assigning Regular time interval to zero. •Editing the Idle Time-out minutes so that information in worker processes and cache are not disposed in a short period of time (e.g two days). Keep in mind that in order for Bizagi web parts to be displayed, you will need to check browser support as posted at Bizagi requirements, especially for Internet Explorer since there are old versions which are unsupported, regardless if you are using them on your SharePoint environment. This means that you will need to locate the whole <system.webServer> element.